Google Voice holds its appeal for its ability to provide you with one number to rule them all. But what if you already have a number and don't want to deal with the effort to port that number to Google? That is why Sprint and Google's joint announcement today of new integration between Google Voice and Sprint sounds so promising. Under this new arrangement, Sprint says its wireless customers will be able to use an existing Sprint phone number to take full advantage of all Google Voice offers. This capability is unique among the wireless carriers, and is due to become available "soon" on all Sprint CDMA phones, according to the company. Sprint customers will face no additional fees for using Google Voice, which unifies up to six different communication devices (such as home line, wireless line, office line) under one phone number through call routing. Among Google Voice's nifty conveniences are call screening, blocking, recording, and a searchable, transcribed archive of voicemails. 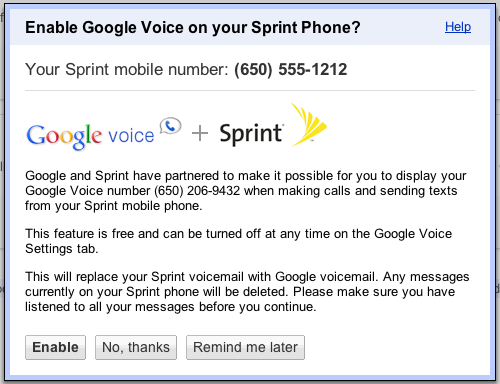 Sprint's deal with Google will save consumers more than just the costs of porting a number to Google Voice. The deal means you'll be ablet to use your existing mobile number with all of the niceties of Google Voice, and not worry about incurring early termination fees, if applicable, when you port the number over-only to have to resubscribe to Sprint under a different number. It also eliminates any potential downtime in the process. Kudos to Sprint for taking this step. It is the first major U.S. carrier to do so, and for now, gives it a notable point of differentiation as compared to the competition. The big question is: Which carrier will do so next?